When I was young I was diagnosed with a kidney disease and spent a lot of time in hospital, missing about two years of primary school. As a result, I became a reluctant reader. I strive to create stories aimed at reluctant readers, and graphic novels are prefect for that. I talk about all the steps I took in becoming who I am today. I also explain how comics and graphic novels are an exciting, stimulating, different way to tell stories and be creative. I show kids that they can start creating now! I talk about activities kids can start doing straight away. I incorporate an interactive character creation session on a whiteboard designed to encourage young people to be creative. I LOVE your book Pilot & Huxley! I am doing a book report about it for school and need to know your birthdate for the bio. I have got some information off your website, but don’t know your birthdate. Can you please tell me? You are the best drawer in the world! We think they are very creative and we enjoyed making Phillip the duck dinosaur with jelly arms with you 🙂 We are looking forward to starting our own graphic novels and comics. How come your 3rd Pilot and Huxley book is not available in Canada? Loved your first two books, but can’t find the 3rd one. Hi Justin, sorry for the late reply, This message got by me. Unfortunately the US didn’t get the rights for P&H3 so it won’t be coming out there, sorry. But this website has the Australian version and does deliver to the USA. My son absolutely adores the Pilot and Huxley books. He’s just turned 8, and like you really only likes reading comics (and graphic novels), playing video games, and watching cartoons. I can relate (he’s my son after all! ), but there’s a problem here…. we live in the United States, and it’s next to IMPOSSIBLE to find your Pilot and Huxley books here!! He’s got the first book which we were lucky enough to get via the scholastic book fair last year, and he’s read it so many times it’s practically falling apart. We were fortunate enough to find a decent copy of “The Next Adventure” on ebay for less than $30.00 shipped. Now we’re having the hardest time trying to find the 3rd book, “Pilot and Huxley vs Planet Arpros” that will ship to the US that won’t cost us an arm and a leg….can you by any chance point us in the right direction? I would be forever grateful, as we just absolutely adore you and your books. 🙂 Thanks for taking the time out to read our little plea here, and I totally understand if there isn’t much you can do about our little situation. Keep being amazing at what you do, and keep on living the dream. But this website has the Australian version and does deliver to the USA but im not sure for how much. All the best and have a day. hey dan i love your books! i am researching you for school and i need to know what inspired you to become a cartoonist? All things that I love inspire me. Movies, Anime, Video games and comics all give me inspiration. Hi Jackson. 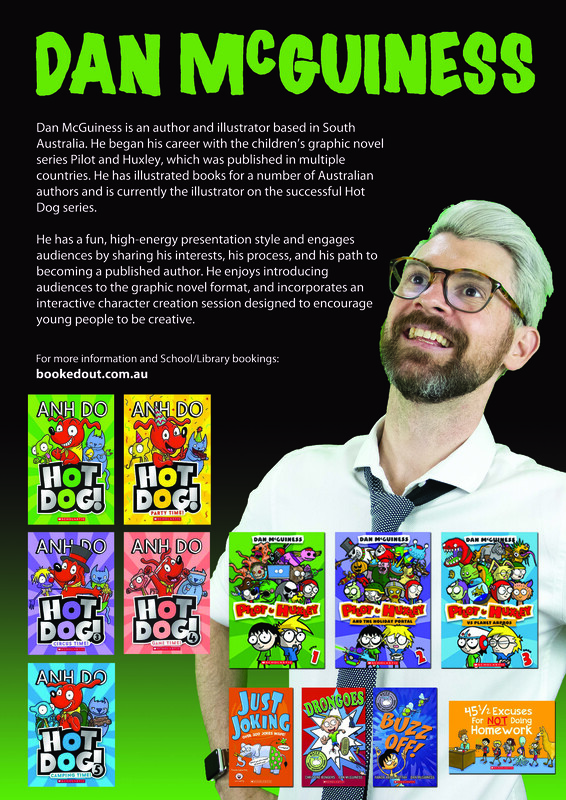 My books are published through Scholastic here (Aus) and in America. Thanks for enjoying my books! My almost 8 year old Huxley and I, his mom, LOVE Pilot and Huxley. We love every time it reads “Holy Huxley”. Thank you for such a fun series! My Huxley says “they are really funny”. Hi Zoe. Your pictures are up now. I’m 13 right now and I still have the first P&H book on my bookshelf. I Had gotten it for Christmas when I was 7 (I Think) and I read so many times to count. I Read so much that I made my own comics. Because of your comics, I make comics now! I’m thinking about making it a full career if possible. BTW, Do you have any drawing tips for me? Hi Dan I really like your books’ pilot an Huxley is my favriote I’ve read it like a million times I was thinking. Can you please make a pilot an Huxley 4 I know you might not make a pilot an Huxley 4 but it would be funny to see pilot an Huxleyas adults. an they go on another adventure I was about to tell you your my favriote author ever.my friends really like your books to I hope you read this by Dan.